A beautiful and quirky community with abundant views and a thriving arts scene, Carbondale serves as both a bedroom community for Aspen, 30 miles south, and a retirement and second home location for those who want a scenic setting not too far from some bigger cities and their attractions. 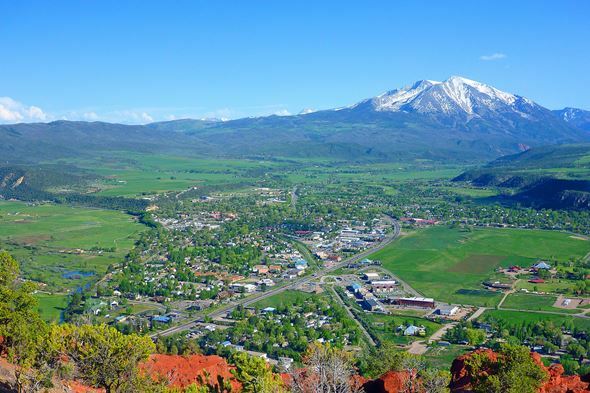 Carbondale is 12 miles from Glenwood Springs in the Roaring Fork Valley and is overlooked by 12,953-foot Mount Sopris. It was named for Carbondale, Pa., the former home of some of its early white settlers. The Northern Utes, who originally occupied the area, were driven out and resettled on a reservation in Utah. The newcomers grew crops to help feed miners in Aspen, where silver mines were booming. Their biggest crop was potatoes. Potato Day began in 1906 and is still celebrated with a fall parade and cookout in Sopris Park each September. The railroad came to town in 1887, and Carbondale was incorporated in 1888. Later, coal was mined nearby in the Crystal River Valley, but after a methane gas explosion that killed 15 miners in 1981, the mines closed down. Briefly, oil shale development was explored in Garfield County, but those efforts collapsed in 1982. Another economic upturn began in the 1990s, with development related to Aspen’s dramatic growth as a high-end resort for skiing and tourism. Many workers live in Carbondale where real estate is more affordable, although property values continue to climb. Residents boast that Carbondale is a real community, focused on the arts and outdoor recreation and summoning tourists to the natural beauty that surrounds the city. The historic downtown is welcoming and folksy, featuring art and shopping, dining, bars and a cinema. Walking tours are available at the downtown Visitor Center. The Mount Sopris Historical Society, located in the 1891 Holland-Thompson cabin, holds historic treasures in its archives. The Penny Hot Springs are a short drive south of Carbondale on the Crystal River, along Colorado 133. Dan Penny opened the springs next to a hotel he owned nearby. Land area: 2.0 square miles. Altitude: 6,181 feet above sea level. Climate: Carbondale averages 295 days of sunshine, with low humidity, cold but mild winters and comfortable summers. Average snowfall is 45 inches. January’s average high is 36 degrees with a low of 13, and July’s average high is 89 degrees with a low of 52.